Our first release of Hopstitution XPL will be released Thursday, December 5th. It will feature three new experimental hops, HBC-344, HBC-291 and HBC-462. Pours golden amber with a finger of white head, good amount of lacing. 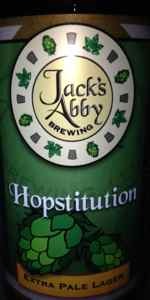 Not as big on the nose as the other Jack's Abbys that I have had, got a bit of nice grassy, hoppy aroma. Tastes just what you want from a lager, crispy and clean with nice citrusy from the hops, finishes with good amount of bitterness. Medium to light bodied with nice amount of carbonation. Overall a very good summer lager! Crisp, hoppy and bitter, refreshing beer! I love the look of this beer. To me, this is a quieter version of Kiwi Rising. Well done. Bottled on 10-4-14. Poured into a Tired Hands pint glass. This reminds me very much of a lager version of a "session IPA". Crisp, grainy pilsner malts prop up a substantial hop bill that veers between piney/resinous and tropical/citrus notes. Pine, grapefruit, orange peel, mango, and fresh cut grass intermingle wonderfully before finishing dry, clean, and slightly bitter, with a lingering stone fruit flavor. Super smooth and super crushable, yet still packed with bright, vibrant hops. Amazing stuff... This would be a regular in my rotation if I had access to it. Recommended for sure.